Medical Journalist Randi Hutter Epstein presents an easy-to-understand, yet not patronizing, overview of childbirth across time. Each of the book’s five parts features some aspect of the cold, unvarnished reality faced by pregnant women and the subsequent delivery of their babies. The time frame discussed in the book spans the ages; however, the 19th and 20th centuries are Epstein’s primary focus. Clearly, fads and political movements in these two centuries have had a heavy influence on how childbirth has been addressed. The ongoing struggle between physicians and midwives for clientele became an ugly smear campaign, never mind that nearly all doctors were male and that they perpetuated ludicrous theories for hundreds of years causing massive harm to their patients. Dr. Epstein conveys her views in a most engaging manner. She has a very strong sense of irony and makes good use of it. This reviewer was unaware of the sometimes-bizarre methods employed in the past during delivery, including twilight sleep that wiped out all memory of the childbirth experience. Never mind that during labor a woman using twilight sleep had to be lashed to the delivery table in order to keep her from falling off while writhing in pain. There is some overlap among chapters with regard to the material covered. A reader interested in a particular section of the book will find a comprehensive write-up much like a stand-alone article. This makes perfect sense because the author is a widely published medical journalist. There does not seem to be an intended audience for Get Me Out. Rather, most anyone can benefit from the book, as was the case for this reviewer whose granddaughter was born right after I finished reading it. By the way, Dr. Epstein has four children of her own which qualifies her on yet another level. This review was written by Ruta Arellano. A review copy was received from the publisher. 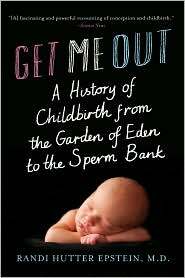 Coming up next, a review of Get Me Out: A History of Childbirth from the Garden of Eden to the Sperm Bank by Randi Hutter Epstein, M.D. Victoria Loustalot – Plays well with words. Joseph's Reviews · A book review site.